About "NKJV Compact Reference Bible Brown (Red Letter Edition)"
Dive deeper into God's Word and carry it wherever you go. 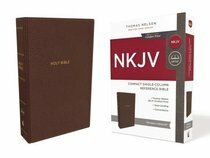 The NKJV Compact Single-Column Reference Bible offers all you need for engaging in a deeper understanding of the Bible-in a convenient and portable volume. It slips into a pocket, purse, backpack, or briefcase while still containing reference Bible essentials. The Bible's small size doesn't hinder readability; the Thomas Nelson NKJV Comfort Print® typeface allows for comfortable and enjoyable reading. The comprehensive cross-reference system, book introductions, full-color maps, and more will guide, enrich, and strengthen your knowledge of God's word. Combined with careful attention to all the classic and elegant details, the Compact Single-Column Reference Bible is a beautiful choice for a travel-friendly NKJV reference Bible.